Submitted by Kally Mavromatis from the Cleveland Clinic Healthy Heart and Lifestyle Guide and Cookbook. Roasted chickens are frequently on sale at our local supermarkets. Whenever they are, we buy two – one to roast right away and the other to put in the freezer for a future meal. Any leftovers are welcome the next day for salads or sandwiches. Here we’ve added a bevy of root vegetables that roast alongside. Rinse the chicken, discarding the giblets, neck and any visible fat. Pat dry with paper towels. Place the chicken on a rack in a shallow roasting pan. Lightly coat with cooking spray and sprinkle with the Italian seasoning. Roast for 30 minutes. Meanwhile, arrange the potatoes, carrots, and parsnips in a second shallow pan. Coat with cooking spray and sprinkle with Italian seasoning, pepper and salt, if using. Place in the oven alongside the chicken and continue to roast for another 35-45 minutes, until the chicken is done and the vegetables are golden brown and tender. Transfer the chicken to a carving board and the vegetables to a heated serving platter. Allow the chicken to rest for 10 minutes before carving, discarding the skin. Add the cut chicken to the platter and serve. This recipe makes about 6 servings. 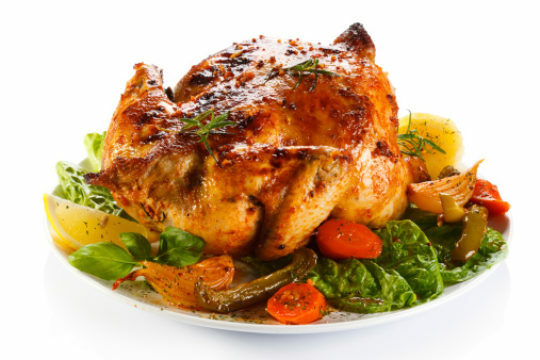 One serving contains 3 ounces of chicken plus one-sixth of the vegetables.